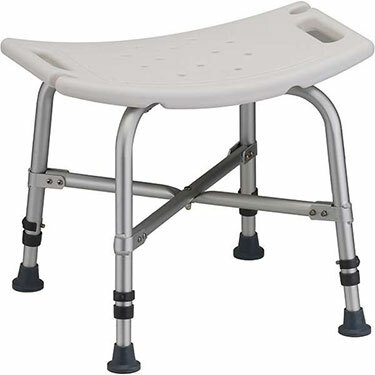 The Bariatric Bath Bench by Nova has an aluminum anodized frame and heavy duty seat that make it safe and secure for the user. All bath items are non-returnable for hygienic reasons. Fully assembled and sturdy. Like handle for assisting with standing. Small shower but fits well and great aid for me with arthritis. Pros:Size and sturdiness & height just right for me. Bought this bench to replace a year old one. The legs began to flare out (basically collapsing )and the bench plastic started to break down. This bench has extra support on legs to prevent flaring. My only complaint is that the height of the legs is difficult to adjust...for my arthritic hands. So I use it at the mailing height. This fit nicely in my shower and the adjustment gave me exactly the right height so that both my wife and me can use it. Pros:Seat is nice, drains well and is useful for toweling off.